Custom powdercating finish - hundreds of colors available. See description below for details. 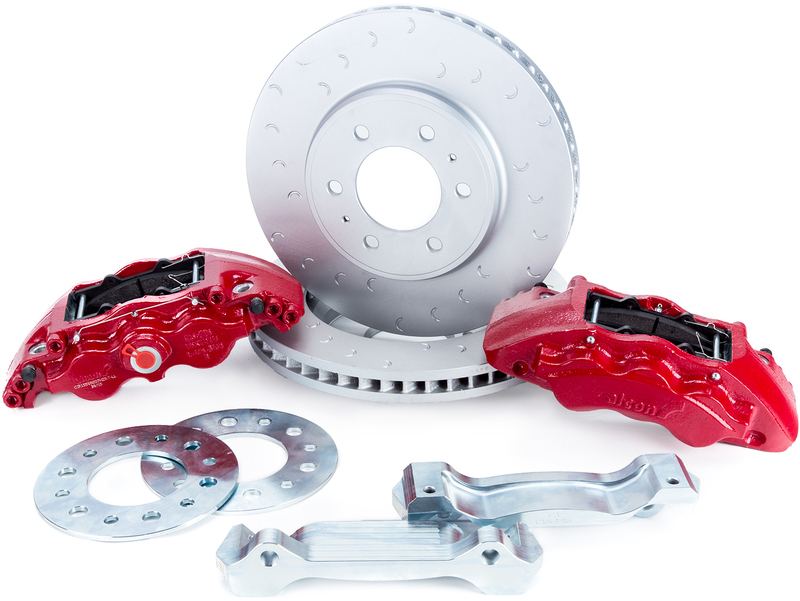 Alcon introduces the Ford Raptor / F-150 Complete Heavy Duty Brake Kit for the Gen2.. This kit represents a substantial upgrade in braking performance and includes features not found in any other kit. HIgh temperature seals as used in motorsports applications, dust seals for performance in the worst conditions, and a low profile designed to fit under your OEM wheels. These kits include everything you need including calipers, adapters, spcers, hardware, and performance brake pads! The kit is compatible with your stock master cylinder AND parking brake. Front kit only click here. WILL IT FIT YOUR WHEELS? Use our downloadable templates below to check against your OEM wheels. Our brake kit is designed work under OEM and beadlock wheels. If you've gone to big tires and big suspension, you'll want this kit. Check your fit. This kit was designed to fit under all OEM 17" wheels! HOW SOON CAN YOU GET IT? WHAT ABOUT SPARES? Best yet - all kits and service items are stocked in the USA for the fastest service. Next day delivery on all components is available when you're in a hurry. Note: If you own a 2009-2011 F-150 you will need to order part #’s FOCL3Z-2210-C and FOCL3Z-2209-C from your local Ford dealer to finish installation. 2010 – 2014 Raptor Requires – A.D.D. Tie Rod adapter kit AC011507NANA or A.D.D. Full Billet Tie Rod kit AC01150299NA (or other manufactures similar tie rod kit to provide clearance to inner face of rotor). Vehicles with the A.D.D. spindle upgrade will already have tie rod end kit.